Online Friendlies: Enjoy new ways to play on Nintendo Switch including online Friendlies. Invite anyone from your friend’s list and track your rivalry through a five-match season, both in FIFA and FIFA Ultimate Team. Immerse yourself in the mos authentic football experience ever seen before on Nintendo Switch. Featuring distinctive team and player personalities, introducing official broadcast presentation for the some of the world’s biggest leagues, and elevating your ability to finish with the all-new striking overhaul. Striking Overhaul: Added shooting variety provides players with a new level of control when finishing. The striking overhaul provides the ability to better contact first time shots, drive dangerous dipping strikes, or finish with clinical finesse, giving players more options in-fron of goal. In addition, the new Timed Finishing mechanic adds a further level of control to finishing. Users tap once to initiate a strike and tap again on contact, with perfectly timed strikes more likely to find their target, and poorly timed strikes more likely to miss the mark. 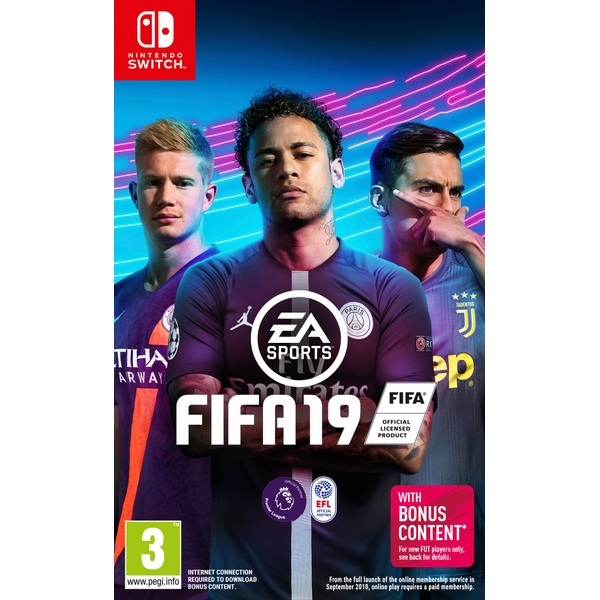 FIFA 19 Ultimate Team: Build your dream squad from thousands of players and compete in the most popular mode in FIFA. Featuring content from UFA Champions League and Europa League, the world's most prestigious club competitions come to life with live content in FIFA 19 Ultimate Team.